Our dilemma is that we can do nothing about our heart. We can’t change it, purify it, or redirect its passions. We urgently need a savior. I see every corridor of your heart. 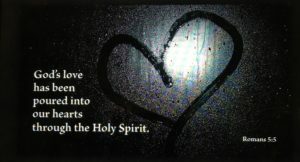 The Holy Spirit will purify the uncharted regions of your heart that you don’t even know exist. If the Holy Spirit could only cleanse the conscious part of your life, you would have no hope. But He also has power over your unconscious dreams and imaginations. You just need to ask. I am God from the early morning to the late night. I am God over all things. I hold all things together. I am the one who completes all things. My blood cleanses you from all sin. I reserve a place of sanctity in the Holy Spirit where your body, mind, and soul thrive in unspotted integrity and agreement. “May the very God of peace sanctify you completely. And I pray to God that your whole spirit, soul, and body be preserved blameless unto the coming of our Lord Jesus Christ” (1 Thess. 5:23). “But if we walk in the light, as he is in the light, we have fellowship with one another, and the blood of Jesus, his Son, purifies us from all sin” (1 John 1:7). I grew up seeing dramatic race prejudice on my mother and father’s side of the family. I have to “check-in” with the Lord often to make sure my heart is clean from this heritage and it has no part of me. What a terribly sad condition. It is the darkest side of the human race. How could such a deplorable state come about in the lives of people? The answer is simple, “Adam’s fall.” Cain, the first child born of the man God created, shed the blood of his brother. Can you imagine such a thing! 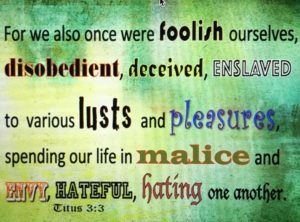 Humanity’s love of their own people, implanted in their hearts by God, soon changes to murderous hatred. Love of country becomes the source of race-hatred and bloodshed. God judges and tests us. He now places the races side by side to see if our Christianity will enable us to overcome race-hatred. Does it really matter what race you are? We need to remind ourselves over and over again that we cannot love in our own strength. Our love will always run out at some point. Our love is not perfect; it will fail. It is only as we are wholly surrendered to the Spirit that we will be able to live according to God’s will and walk in love towards those around us. What I believe we have failed to realize is that we learn to know the person of the Holy Spirit in the secret place of prayer. 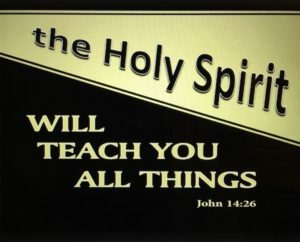 You see, the Holy Spirit is sensitive; it is His nature. You will not become acquainted with the Holy Spirit amidst the noise of the day or the clamor of work. You must engage Him and listen to Him in the secret place. Open your spiritual ears to hear now (Rev. 2:17, 3:6, and 3:22). You may know the fullness of God’s love on one condition: you must be strengthened by the Holy Spirit so that Christ may dwell in your heart. Take this message from God’s Word. Unless you are on your knees you cannot live in the love of Christ. A life of prayer will make a life of love to Christ, other Christians, and those without Christ a reality in your experience. We are called to enter into fellowship with our God. And this unique invitation is to know the Godhead in His fullness and individuality. Each part of the Godhead is God in the reality of a Person who is eternal. And God’s desire is to reveal all three Persons to us. We are unable to render to God the love He so freely gives to us. However, the Holy Spirit helps us in our weaknesses. The Father has sent us this advocate to teach and guide us. We find this intimate fellowship with the Father, Son, and Holy Spirit in prayer. It is with us as it was with our Savior; while Jesus was being baptized He prayed and the heaven’s opened; God the Father spoke, and the Holy Spirit descended and engaged Jesus. The Godhead was revealed to man in prayer. Pray dear saint; it is time to experience this personal fellowship with the Father, Son, and Holy Spirit. Are You Growing Day to Day With the Lord? Are You Growing Day to Day? Many Christians fall away for periods of time because they have not been taught the truth that every Christian must learn the necessity of fellowship with Jesus each day. Our joy in the Holy Spirit and forgiveness of sins are preserved by daily prayer and fellowship with our God. Are you growing day to day in your maturity as a disciple? The one condition that is requisite for your growth and power is time alone with the savior every day. Read Matthew 11:25-30. 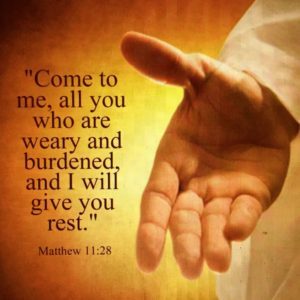 Let His words permeate your soul: “Come unto me…I will give you rest. Let me teach you…you will find rest for your soul.” This is the invitation He gives to all Christians, young and old. Our Lord is humble, peaceable, and full of grace and mercy. You can grow in intimacy with Jesus day to day; it really is very simply. Can a Sophisticated Person Have Faith Like a Child? The question you must ask yourself is: Do I really trust my heavenly Father the way a little child trusts? Your prayers will reveal your belief system when it comes to trust in the Father. So simple, so conversational, so unprofessional, so real. That’s the way He teaches us to pray. He desires the honest simplicity of praying like a little child, not praying to be heard by others or attempting to impress God. Now there is an outlandish thought. Can you imagine trying to impress God with your prayers? What a waste of time. In coming to our Lord in prayer with the spirit of childlikeness, we will realize the Fatherhood of God in our lives. departed into a solitary place and there prayed. hundreds of miles from the place where I was praying. I was teaching in the department of religious studies in Asbury College when I entered into the covenant of prayer with Christ. It had been my purpose for several months to prepare some written messages on the Epistle of Hebrews. In order to have time to devote to this work it was necessary for me to arise early in the morning and do the writing before the hour I was scheduled to meet my classes. I began this work during the first week of 1950. I was suddenly awakened about midnight on January sixth. Knowing that I had a full day of work before me, I felt it necessary to sleep a few hours lest I be too weary in mind and body to do the writing and teaching. At that moment the Savior spoke to me. He asked me if I were willing to sacrifice some sleep in order to give Him an opportunity to speak with me in the quiet hours of the morning. He told me that it was necessary to deny myself of sleep in order to prevail in prayer. 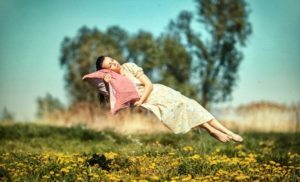 I realized for the first time that denying myself of sleep was a form of fasting. For five hours I waited before the Lord in sacred worship and Holy Communion. My soul was greatly revived, and I felt refreshed in mind and rested in body. After this remarkable manifestation of the savior I was constrained to examine my prayer life. I was impressed to consider the time spent in prayer during the average day. I was humbled before the Lord when I discovered how little time had been given to Him in prayer and meditation. It had been my daily practice from the day I was saved to spend some time in prayer morning and evening. I had established the family altar in my home. I had spent time in secret prayer during the years of my ministry. I had never knowingly overlooked the importance of prayer. I am now aware that I had never discovered the possibilities in prayer like they were revealed to me when I waited five delightful hours before the Savior that memorable morning. When I entered into the fellowship of prayer with Christ, I solemnly promised Him that I would not allow my plans and pursuits of daily life to infringe on my time to pray. I vowed to take sufficient time to commune with Him in prayer no matter what duties of the day demanded my attention. I placed my ministry, my teaching, my writings, my vocation, my travel, and my home in heap before the Lord. I separated myself from them in death. I deliberately put these earthly concerns in a place of secondary importance in my life. I counted all things loss for the excellency of the knowledge of the fellowship with Christ in prayer. I was reminded of how much I had lost through the years because I had not known the value of fellowship with Christ in prayer. But, the Lord is a redeemer. He restores all things in His time. When we make our requests know unto God by prayer and supplication with thanksgiving we are assured of receiving His peace through Christ Jesus. The house of prayer is the sanctuary of peace. 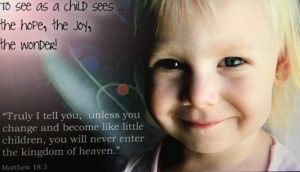 It is not necessary for the children of God to enter heaven in order to enjoy the priceless possession of peace. There will be times when our feelings will contradict our faith. Sickness can depress our emotions to such an extent that we are disposed to doubt even our relationship with Christ. There will be times when we stand on the brink of an impassible gulf, which the human understanding cannot cross. But, the Savior has paid a great price to redeem all. He will not withhold His saving grace and mercy from any seeking soul longing with all the heart to please Him in all things. The peace of God will prevent us from becoming the hapless prey of distraught minds if we will pray without ceasing, and continue to believe on the name of Jesus. If we continue to make our requests known unto God by prayer and supplication with thanksgiving, He will not suffer us to be moved by the forces of evil in this earth.